Frustrated listening to all the sides of a story and your support and advice falling on deaf ears? 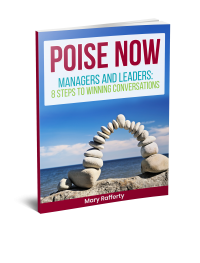 Feeling stumped about a team or group of staff not getting along with each other? Concerned that a Manager isn’t coping very well with difficult behaviour from team members? As a HR professional these kinds of issues are the ‘bread and butter’ of your job. But because you have to wear so many different hats in your role, it’s hard to be an expert at them all. Should you out-source the solving of these kinds of problems to an external person? And if so, what should you be looking for – Conflict Coaching? Facilitation? Mediation? 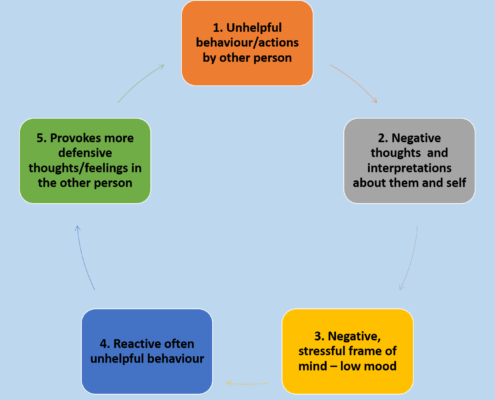 The cycle starts when a person or persons people become annoyed, upset or fearful about how they perceive another individual or group is interacting with them or behaving towards them. They have increasingly negative thoughts about that person/persons which in turn causes them to experience a greater level of unpleasant emotions such as anger, hurt, irritation etc. This consumes huge amounts of their positive energy and motivation and they can begin to see themselves as the ‘victim’ of that other person/persons behaviour and attitude. Frequently, they will also have a story in their minds about that person’s behaviour in some way undervaluing us or undermining them. Their mood or state of mind are affected, particularly at times when they have to communicate or interact with this other person(s). Their own style of interaction becomes reactive and negative. They might get angry or emotional or maybe withdraw and go silent or minimise any communication. Their reactive behaviour now impacts on the other person. Their state of mind and emotions are affected and they counter with some sort of defensive behaviour on their part and so the cycle continues. Coaching is essentially working with the person on a one-to-one and is helpful at any stage of an intervention. It gives each person an opportunity and space to have their situation listened to non-judgmentally and empathised with. People talk about feeling ‘lighter’ having talked through a situation. More importantly, it frees up mental and emotional energy to help them think more strategically about how to problem-solve about the situation they are in. Coaching builds resilience. When people get caught up in conflict situations they fall into a helpless, victim mindset where they lose the sense of their own personal power and see the other person as ‘making them feel’ a certain way. This undermines their resilience and bounce-backability. Often, they have let the other person also dictate how they view themselves – thus you hear people saying they feel ‘undervalued’ and ‘undermined’, ‘worthless’ etc. So getting them back on track, in touch with their own innate well-being and personal strength will enhance their ability to resolve the issues with the other person(s). Thirdly, coaching supports them around constructive communication. 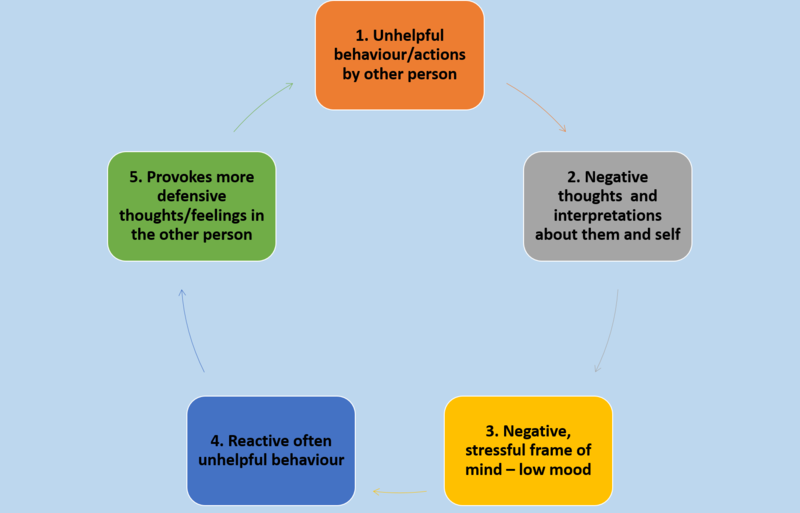 As the cycle above shows, the first victim of difficulties in working relationships is effective communication. Arguing and defensive responses replace listening, understanding and the kind of easy give and take that characterises healthy working relationships. Coaching helps people plan a problem-solving conversation with the other person. This means getting crystal clear on what they need to say and most importantly, how to say it in a way that the other person is likely to listen rather than react. Mediation and (Team) Facilitation are about creating a safe space for a dialogue to take place between the two or more people involved in the situation. That dialogue can have a number of different purposes. Problem-solving and reaching a mutually liveable-with agreement around the various issues – whether these relate to concrete projects and tasks or behaviour and interaction styles. Clarifying misunderstandings that have damaged trust. The cycle of negative interaction leads to misinterpretations and unclear assumptions about each other. Mediation is an opportunity to unravel these and allow each person to get a clearer view of the whole picture. A further value that mediation can provide is an opportunity for people to have their voice listened to and heard by the other person. That can help to restore the resilience and get them back into their own sense of power. Mediation is usually governed by key principles that people sign up to such as confidentiality, the voluntariness of the process and that they are willing to participate in good faith. What are the roles and formal working relationships between the people involved. For example are they all peers? Is it a disagreement between a Manager and some Team Member(s)? What sort of processes or interventions have already been tried? For example, have you tried to mediate or provide guidance to the individuals around how to work together more constructively? To what extent are each of the people involved aware of that the working relationships are in jeopardy? Perhaps you are acting on foot of a complaint from just one ‘side’ and the other person(s) are only now being made aware of it. On the other hand, you may have a written or verbal complaint submitted which the other ‘side’ has been told about. Maybe one or both parties are using terms like ‘bullying’ and ‘harassment’ to describe their experiences? What level of interest or openness do you sense each of the individuals have to an intervention to assist them? What other kinds of support have been made available, for example, an Employee Assistance Programme (Counselling), Management Coaching etc. What sort of outcomes would you like to see and why are those important? What sort of outcomes do you think the individuals involved would like to see and what might be important to them? I always start by meeting people initially for an initial one-to-one confidential session. Before I meet them I will have sent them some pre-reading and reflection exercises to prepare and bring with them to the meeting. Depending on the number of people involved, the meetings can last any length from 30 to 90 minutes. My aim is to get a sense of the issues they are concerned about and the kind of options e.g. mediation or facilitation, that they are open to participating in. I explain in detail what such processes would entail and invite them to think about the kind of outcomes they might want. It’s also an opportunity to help them reflect on their own mindset and how they can become more resilient in the face of the difficulties they are experiencing. I may also follow up this initial one-to-ones with further individual meetings or phone calls as it can take time for people to get clarity on the direction they want to go and the options they are open to engaging in. As the meetings are confidential, I will not be sharing what each of them have discussed with you the HR professional. However, I will have agreed with them that I can share with you what sort of next steps are being considered or if they we are not proceeding any further with coaching or mediation. In consultation with all those involved, I will arrange a mediation or facilitation session at a mutually acceptable date/time. That is, if it’s looking like this is something people are open to AND my sense is that it has some likelihood of succeeding. The number of sessions vary greatly, depending on factors such as how long people are available for at each session, the number of people and the range of issues. For a two-person mediation it’s common to do an initial half-day session and then follow this up with one or two shorter review sessions at intervals to help keep things on track. Larger teams might require one or two full day sessions followed also with review sessions to monitor progress and ensure they are succeeding in keeping to what was agreed. On the other hand, it might be more appropriate to coach people on an individual basis for longer and build their own capacity and motivation to engage themselves in the dialogue with the other person(s).